The long wait for Apple products in Beijing turned ugly over the weekend when a skirmish erupted outside one of the company’s stores, resulting in a broken glass door and injuries to customers and one employee. Apple’s iPad 2 had just gone on sale, but it was the white iPhone 4, released a week earlier, that caused the trouble. News of Saturday’s incident has circulated in the local Chinese press, with photos on the Web showing an Apple customer bloodied and laying on the ground. A spokesman for Beijing’s public security bureau said on Monday that the parties involved in the dispute had resolved the matter, but he gave no other details. Customers wait to buy Apple’s iPad 2 on Monday, two days after a skirmish erupted outside the Beijing store. “The store team acted to protect themselves and our customers by closing the doors and preventing the group from entering. The safety of our customers and employees is our top priority,” Apple said. 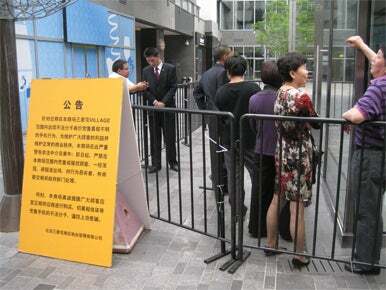 In the last two weeks, long lines have formed outside the Beijing Apple store for the local launch of the company’s white iPhone 4, and then the iPad 2, which went on sale in the country on Friday. Demand for the products has been so great that sales of the devices have also attracted scalpers, who triggered Saturday’s skirmish, according to a source familiar with the incident. According to that person, a man had tried three times to cut in line to buy the white iPhone 4, and had been escorted aside by Apple security. The man then shoved and grabbed one of the security workers, who pushed back in defense, the source said. The man then fell to the ground, refusing to get up, and his mother then got involved by also pushing the security workers, according to the source. Apple employees then decided to lock and close the door to the store. A group of people responded by shaking and grabbing the door. The door then shattered, which injured an Apple employee, the source said. Following the incident, business returned to normal at the store. On Monday, the glass door was already repaired. The long line had also gone, with only about a dozen people waiting to buy an iPad 2 from the store. Notices posted outside, however, warn that the company will contact authorities if scalpers are found selling to or harassing customers. Apple said the demand in China for its latest product, the iPad 2, has been “amazing.” On Monday morning, Apple’s Beijing Sanlitun store reported running out of the white version of the device, but still had the black version in stock. Apple has four stores in China: two in Beijing and two in Shanghai. Apple also uses authorized resellers and its online store to sell its products across China. But on Monday, Apple’s online store for China appeared to no longer offer orders of its iPad 2 or the white iPhone 4.